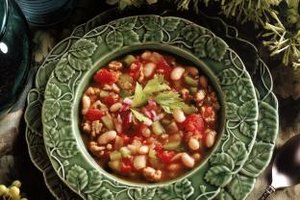 Toss soup ingredients in the slow cooker in the morning and dinner is ready when you are. 2 How Long Does It Take to Cook Linguine? When planning low-calorie meals, choose nutrient-dense foods that include fruits, vegetables, whole grains, lean protein and low-fat or nonfat dairy. Whole grains include whole wheat, oats and brown rice. Choose lean proteins such as boneless-skinless chicken breasts, shrimp, tofu and well-trimmed cuts of pork and beef that have little or no marbling. Fruits and vegetables that contain a lot of water and fiber tend to have fewer calories. Keep the calories you consume low by serving appropriately sized portions and limiting the amount of sugar and fat you add when preparing food. Start to finish, a stir fry takes only minutes to cook. This one-dish meal is loaded with veggies and can be prepared with endless variations. Cut the vegetables and meat in advance and have everything ready when you start to cook. For a basic stir fry sauce, combine soy sauce, water, ginger, garlic and cornstarch. For a sweet and sour variation, substitute orange or pineapple juice for the water. Use any combination of vegetables your family likes, such as carrots, broccoli, sweet peppers and mushrooms. A dash of dry salad dressing and seasoning mix is a quick and easy way to season stir fry. If using shrimp, meat or tofu, cook these first and remove from the pan. Cook the longer-cooking vegetables for a couple of minutes, then add the vegetables that cook in less time. After a couple more minutes, add the protein back to the pan with the sauce. Finish the stir fry with a handful of chopped scallions or bean sprouts. If desired, serve with rice or noodles. Broth-based soups and chilis with lots of vegetables make a homey, low-calorie meal. Add some pasta or rice for a heartier soup. Using canned, frozen or precut vegetables saves on preparation time. Boneless, skinless chicken breasts and extra-lean ground beef or turkey cook quickly and take well to a variety of seasonings and vegetable combinations. A packet of dry salad dressing and dip mix is a convenient way to quickly season soups and chilis. Convenient and filling, canned beans add instant protein to soups. A small amount of lean diced ham adds a lot of flavor to soup without a lot of calories. Simmer for 20 to 30 minutes and dinner is ready. Serve a salad with the soup to make it a more complete meal. Try a green salad, fruit salad or simple vegetable salad with creamy dressing. If you prefer, skip the soup and serve a main-dish salad with a side of fruit. Use low-fat or nonfat ingredients in the dressing and top with grilled or broiled lean meat. For a quick, light meal, consider steaming fish and vegetables in the microwave. Layer strips of firm-fleshed fish in a casserole dish, top with thinly sliced or shredded vegetables and season with a sprinkle of dry ranch dressing mix. Cover and cook in the microwave until the veggies are tender and fish is cooked through. Use hoisin or soy sauce for an Asian flavor, red or green salsa for a south-of-the-border version, or canned tomatoes with garlic and basil for an Italian dinner. Try serving it over rice or angel hair pasta. Serving low-calorie meals can be safe and healthful for the whole family if you consider children's nutritional needs. Make sure kids are eating enough calories per meal for their age and activity level. Also, serve kids balanced meals that contain portions of protein, dairy, fruits, vegetables and whole grains. For example, if you are having vegetable soup and fruit salad for dinner, offer kids some whole grain bread or crackers with their soup and a glass of milk to wash it down. Department of Health and Human Services: How Many Calories Are Right for You? Can You Boil Broccoli & Carrots at the Same Time?